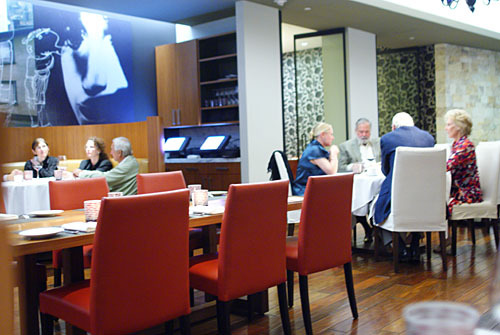 Drago Centro's chef patron Celestino Drago, a native of Sicily, first arrived on the LA dining scene in 1979, at age 22. This venerated, veritable veteran of victuals experienced his first major breakthrough in 1991, upon the opening of Drago Ristorante in Santa Monica. Its smashing success led to the founding of other restaurants in the Drago family, including Il Pastaio in Beverly Hills, Dolce Forno Bakery in Culver City, Enoteca Drago in Beverly Hills, and of course, the $7 million Drago Centro in Downtown Los Angeles (opened in 2008). This latest concept aims to reinvent traditional, local cuisine, the backbone of Italian gastronomy, by incorporating modern techniques and flourishes, representative of the culinary diversity of Italy. The man in charge here is Ian Gresik, who started out as a Pastry Chef at Patina, eventually moving up to the position of Sous Chef. Following a stint as a food consultant, Gresik moved to Europe for a sabbatical, where he immersed himself in the culinary traditions of Italy, France, Greece, and Spain, after which he returned to LA, ready to head up the kitchen at Drago Centro. 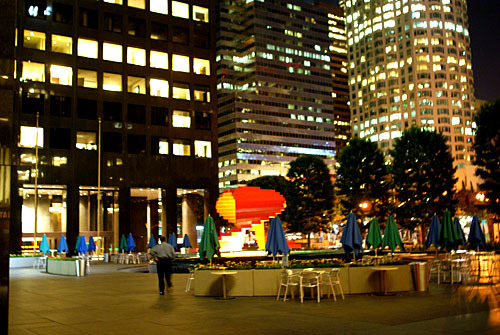 Under the watchful eyes of a canyon of soaring skyscrapers, Drago Centro sits at National City Plaza in the heart of Downtown's Financial District, situated on the site of a former Bank of America. Inside, the interior was transformed from a bank branch to its current glory by Stanley Felderman of Felderman Keatinge + Associates. Inspired by the Rialto Bridge and market in Venice, as well as artists Giorgio de Chirico and Giorgio Morandi, the space combines contemporary, metropolitan flair with the warmth of Italy. The expansive windows invite the surrounding architecture into the restaurant, while the arched ceilings, post-modernist art, stone walls, and a 15-ft high glass wine tower complete the look. 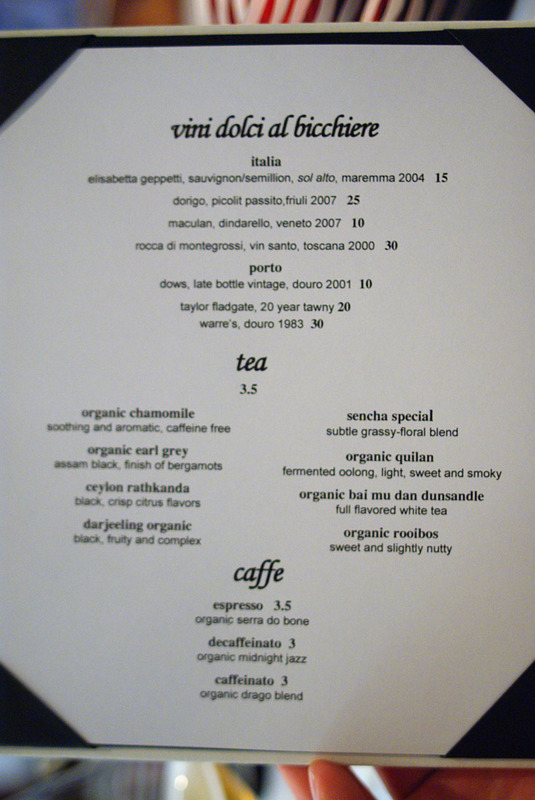 We decided to forego the six-course tasting menu [$75] and order à la carte. 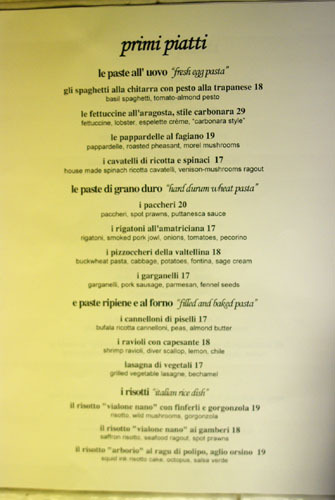 The menu, shown above, features an appealing selection of appetizers, pastas, and mains from which to choose from, though, predictably, the starters do tend to outshine the entrées; click for larger versions. Not in a wine mood, we decided to start off with cocktails. 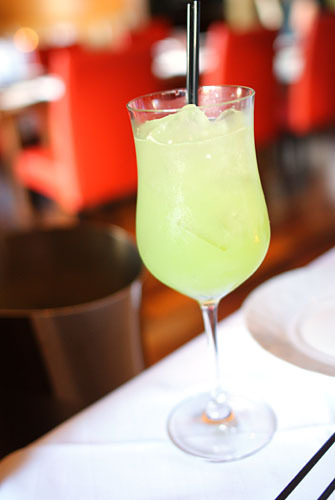 I wanted something light, hence the Sotto Sopra [$12], comprised of Plymouth Gin, Massenez Crème de Pèche, Kiwi, and Fresh Lime Juice. It was indeed quite refreshing, as our server stated, with a sweet, tangy, fruity attack not unlike that of a tropical fruit punch, leading to a slightly hot finish. My dining companion chose the Centro [$12], a more serious drink made with Woodford Reserve Bourbon, Mirto Amaro, and Orange Bitters. 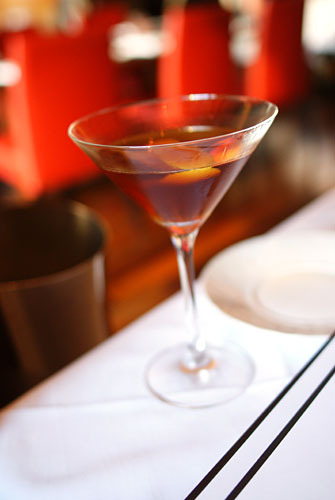 It was a powerful concoction that was somewhat reminiscent of a Manhattan, with subtle orange hints over a strong backdrop of whiskey. 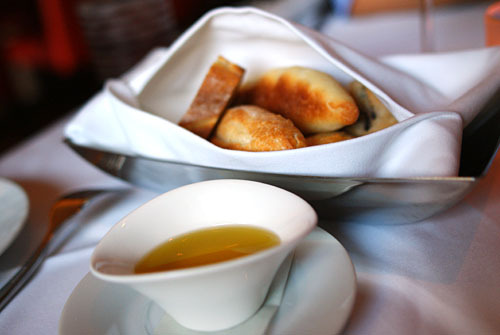 Bread service consisted of breadsticks, olive bread, and wheat bread (excellent), served with olive oil. 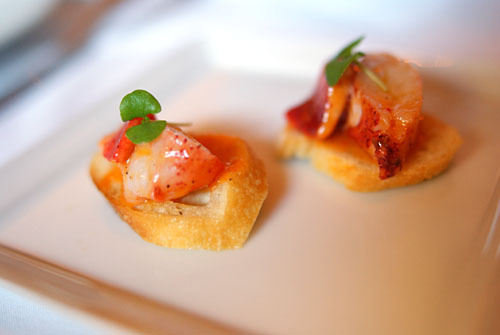 Amuse bouches consisted of a thin, crisp crostino topped with lobster in an apricot purée. The natural sweetness of the crustacean paired wonderfully with the sugariness of the stone fruit, finishing with a slight brininess. The toast, meanwhile, packed a great crunchy textural contrast. Think of this as a savory flan. Surprisingly, the flavor of the foie gras was more apparent in aroma than in taste. On the palate, the crème caramel was rather mild at first, with the foie's sapor intensifying with time, leading to a rather strong, lingering finish. The crisp bread and bitter arugula were key in tempering the gravitas of the liver. Carpaccio is usually a safe choice. Here, the venison proved delicious, though at the same time, it wasn't distinctive--you could've easy told me that it was beef. I appreciated the use of the greens (arugula? ), which balanced out the richness of the meat and olive oil, but the walnuts, with their sweet nuttiness, were a bit too heavy-handed. With our starters finished with, we moved onto the pasta. We ended up ordering three types, and the kitchen, knowing that we were planning to share, decided to serve the pasta as shown above, portioned out for the two of us. I believe this may have been my first experience with garganelli, basically a tubular pasta rolled from a square egg noodle. Though it wasn't particularly unique (it could've just as easily have been penne), it did have a fantastic al dente bite to it, and did well in supporting the rest of the dish. The pork was key were; immensely flavorful, it had a subtle sweetness as well as a great fennel kick that reminded me of the fennel sausage pizza I'd had recently at Pizzeria Mozza. Very nice. 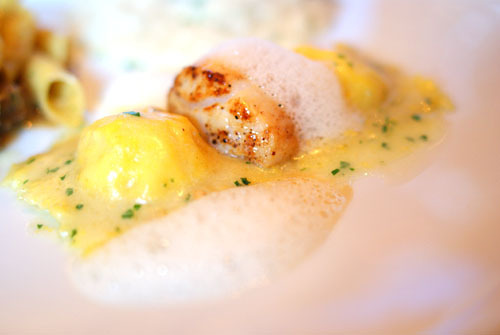 Next was shrimp ravioli, served with scallop. The ravioli were quite nice on their own, with the slight sweetness of the shrimp complemented by the sourness of lemon, with the chili providing a pleasing lingering spicy finish. The pasta could've stood on its own without the scallop, but the mollusk did add a complementary savoriness and weight to the dish. 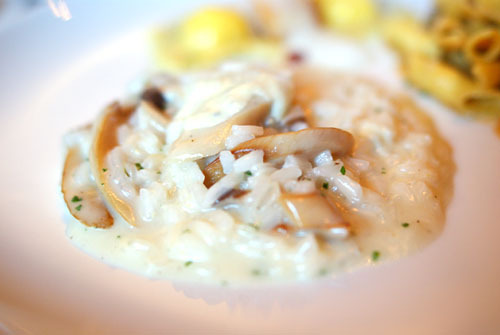 The risotto was made from "Vialone Nano" rice, from the Veneto region of Italy. The short-grain rice is well-known for its ability to absorb flavor, and is a choice selection for risotto duty. The example here was extremely rich and creamy on account of the Gorgonzola, and was deftly balanced by the toothsome, earthy mushrooms. A very straightforward, but effective risotto. With ours cocktails downed, we decided to do beers next, and fortunately, Drago Centro had a pretty comprehensive selection. We both did Belgians; I went for the Tripel Karmeliet [$9] from Brouwerij Bosteels, which showed tasty notes of citrus, barnyard, honey, and spice--the hallmarks of a great Tripel. My dining companion's Belgian was Brasserie de Rochefort's strong dark ale, the Trappistes Rochefort 6 [$10]. Another great beer, a combination of chocolate, fruit, yeast, and dark malt was the ticket here. Branzino, or European seabass, is often served whole, so it was a fantastic change of pace to have the fish prepared tableside (saves me the trouble of dealing with the bones!). 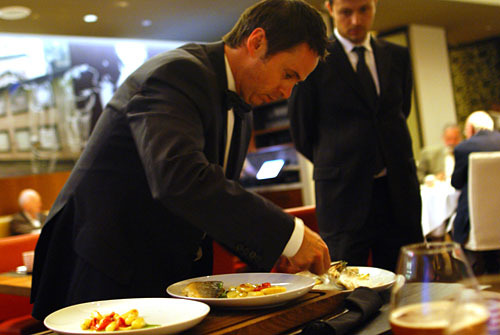 In the photo on the left, we see the fish being filleted by a rather nervous-looking server, under the watchful eye of who I believe must be his superior. 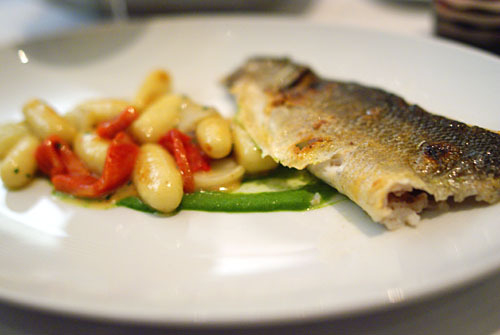 In any case, the fish itself was superb, easily the best branzino I've ever had, with an intoxicating aroma, intensely saporous flesh with just a hint of pepper, excellent texture, and wonderfully savory skin. The accoutrements provided were key in balancing the relish of the fish, with the lettuce especially proving to be a fitting contrast. As seen in the menu above (click for larger versions), desserts here are a bit more interesting than those at your typical Italian eatery. Provolone - One of the most well-known Italian cheeses, Provolone is a semi-hard cheese made from whole cow's milk. Here, it had a mild flavor with a light sweetness and subtle smokiness. Caciocavallo - Caciocavallo means "horse cheese," and anecdotally, it was originally made from mare's milk. 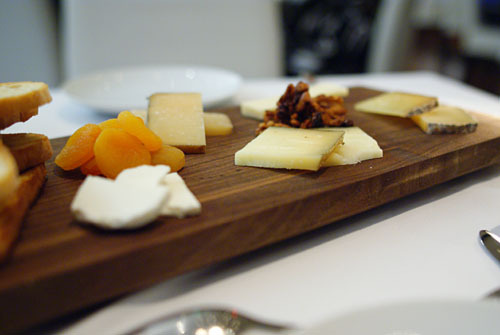 Today, the milk is from sheep or cow, resulting in a musky, tart, strong-tasting cheese. Bianco Sardo di Moliterno - From Sardinia comes this sheep's milk cheese. It was rather mild, especially compared to the Caciocavallo, with a marked earthiness and herbaceousness intertwined with a delicate tang. Pecorino Foglie di Noce - Next was this pressed sheep's milk cheese from Tuscany, which is wrapped in walnut leaves and rubbed with olive oil, making for a dry, crumbly cheese with a slight nuttiness. Goat Cheese - Our final cheese was identified by our server as merely a "goat cheese;" I should've pressed him further. No matter, it was a very creamy one indeed, almost like cream cheese, with a light saltiness backed by a very pleasing zest. Immensely spreadable. Looking at the dessert menu, this was the one item that we both knew we had to try. The reason? We were both thinking of the amazing doughnuts we had at our last excursion to CUT. 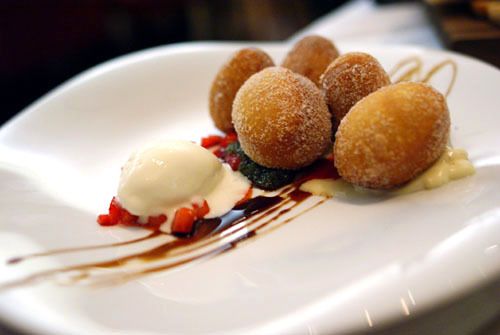 Though the bomboloni didn't quite reach the loftiness of that experience, they were delicious nonetheless. The doughnuts themselves were appropriately dense, and covered in sugar, they would've been fantastic on their own. However, the counterpoint provided by the creamy gelato and tangy fruit proved very apt, while the use of basil added that extra touch to take the dish to the next level. 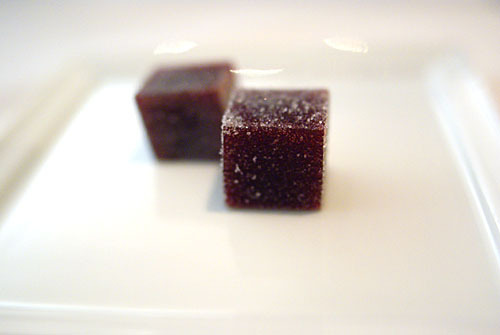 Closing out the meal were two cubes of raspberry gelée. Extraordinary rich and jammy, eating them was not unlike eating raspberry preserves. Portmanteaux, alliteration, Kev, you are on FIRE this week! 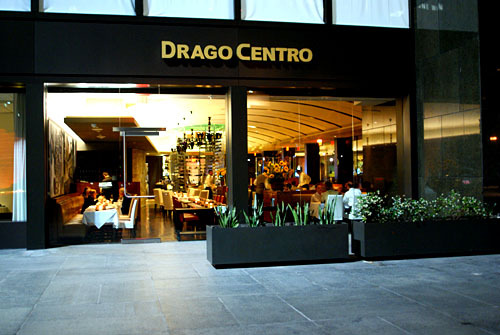 I really enjoyed Drago Centro when I went, not long after they opened. I feel somewhat the same way about Italian food, love it but it's not a food style I find breathtaking. 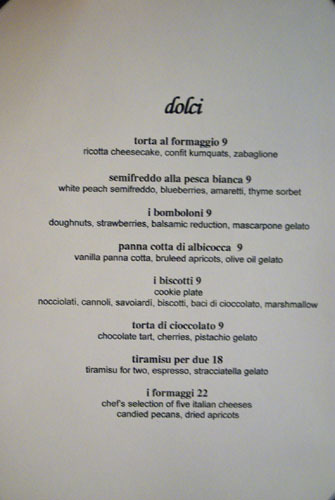 Have you tried Bartollotta yet? Italian is my least favorite cuisine. I know that's total blasphemy to some, but just know that you're not alone re never having been blown away by an Italian meal. 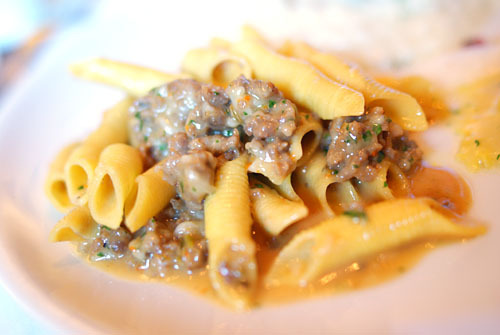 When I went to Drago Centro, I couldn't stop giggling about the garganelli. All I could think of was Gargamel from The Smurfs. Yes, I am eight. I really wanted to like Drago Centro, especially because I can walk to it. Actually, the food was not bad when I went. But the service was atrocious, and I don't see myself going back for that reason alone. that poor server. he does look rather nervous. sorry to hear italian food doesn't knock your boots off. I am certain that Maggiano's will be the Italian meal that knocks your socks off! ONE POUND OF PASTA PER SERVING! SOCKS OFF! Well done Kevin. Great review. 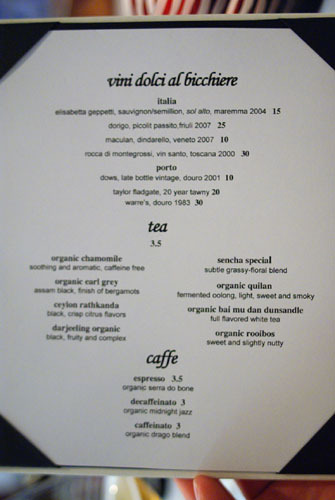 Along with Liz's, I am convinced - I need to try this place. i feel that italian food in the US has a bad rep in general. 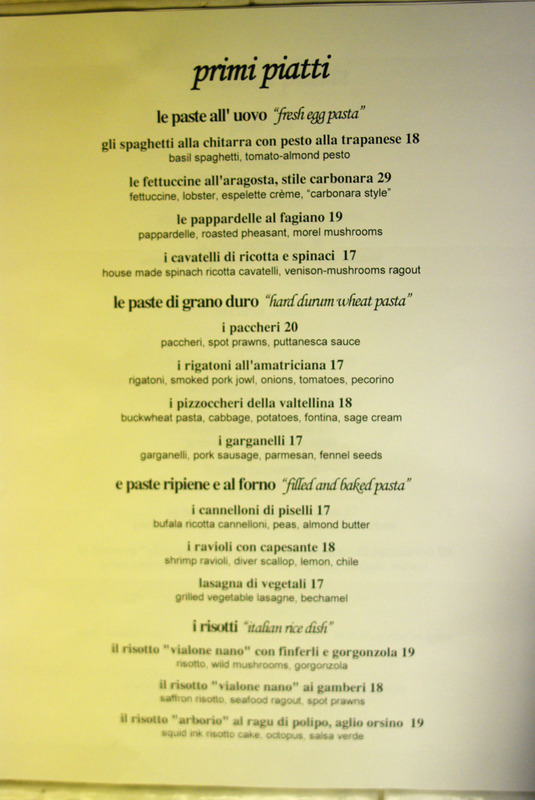 along with chinese food, italian food is usually associated with value and family-style. 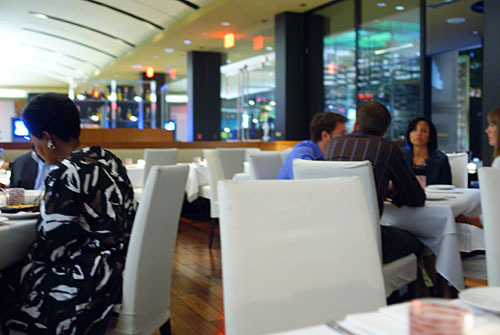 americans tend to lean toward french or japanese (or "martian" as of late) when it comes to expensive fine-dining. so maybe the general lack of depth in american italian restaurants is caused by the market it caters to, not the cuisine per se. i assume that spago or valentino did not "blow you away." next time when you come to chi-town, i'll take you to spiaggia. hopefully that will be more impressive. 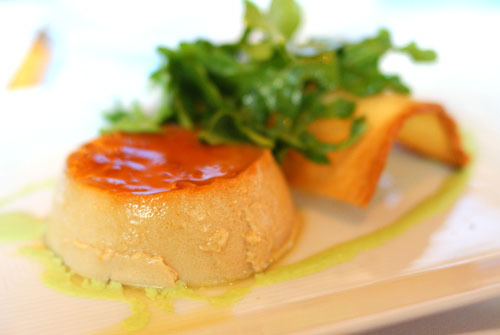 I have to go for the Foie Gras Crème Caramel! I've never been to a Michelin starred restaurant in Italy, however I would say I've had two high end meals (and many casual) there. I haven't had anything in L.A. that even closely rivals those experiences. My impression is that great Italian food is still based on terroir and quality of ingredients that you simply cannot get here. Those high end meals I had were completely un-creative, perhaps "pedestrian" but I still consider them some of the greatest meals of my life. They were also extremely reasonable. For these two reasons, I don't really do Italian food in L.A. The quality isn't as good and it's about twice as expensive. I'll go to Mozza for a good meal, but I don't consider it Italian really, it's Mario's take on it. Lizzie: Yes, for some reason there, I felt compelled to channel V for Vendetta. Did you catch "fare the fish first, followed fastidiously" on LudoBites as well? ;) And Bartolotta at the Wynn? No I haven't been there; how was it? Sook: I felt kinda bad for him there as well. Perhaps he was a newbie? Cathy: Sadly, I've been to Maggiano's. My socks remained firmly on. sygyzy: I just went and reread Liz's post on the two Dragos. Be sure to report back if you go. Rich: I think you may have hit the nail on the head. 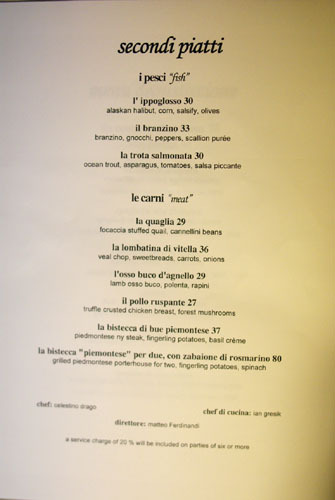 With Italian, I guess I've never really gotten that excitement, that feeling of wonder I've experienced with places like Alinea, Robuchon, or Urasawa. 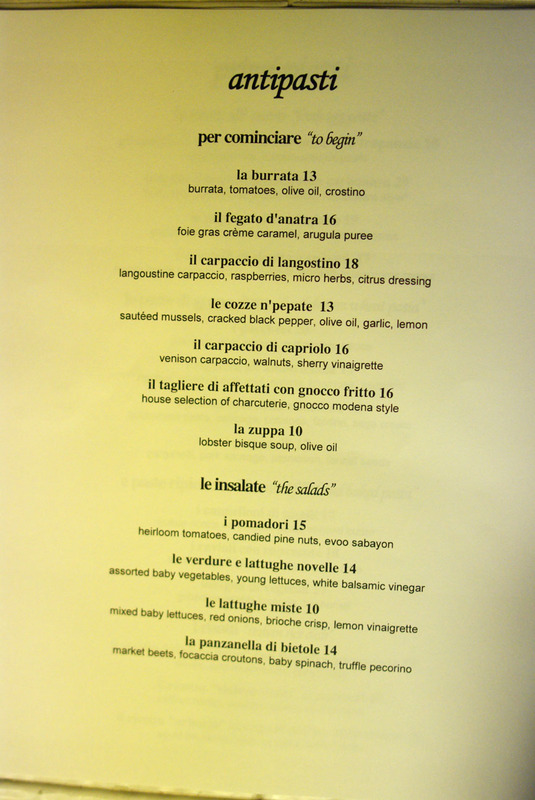 In any case, I just checked out Spiaggia's tasting menu, and it looks like it's going in the right direction. Jo: Indeed. Of all the things I had, that'd be the most interesting one to try! Dudeness: I think you bring up a good point, one which ties into Rich's comment above. 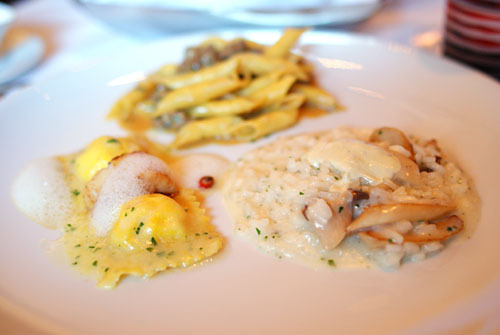 I do want to travel to Italy, to experience Italian cuisine in its natural environment. I think that's what it'll take for me. If you ever visit MN, go check out, Broder's Pasta Bar, i think you will like it. Good review Kevin, I'm going to try Drago in a couple weeks. However, I have to respectfully disagree with your 'pedestrian' comment. I find it almost insulting. The three restaurants you later reference are easily $300pp. Italian food done right is more on the rustic, soulful side. I heard you were at Angelini last night, it won't change your opinion, been twice and I'm still perplexed by its reputation. My votes go to Osteria La Buca,La Botte, and Amarone. And it has nothing to do with the lack of fresh ingredients available, listen to anybody talk about Chez Panisse. There are fresh ingredients in CA. Dason: Thanks. Broder's looks pretty good, especially for MN. No Italian for you on your visit to LA? 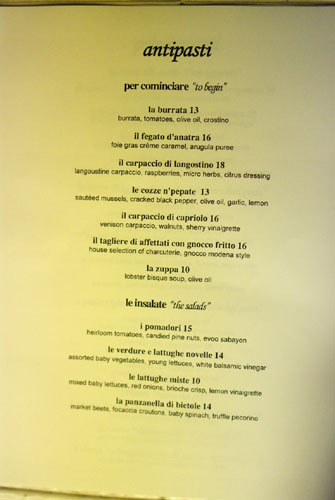 Liz: I may attend the 5x5 at Angelini Osteria as well, but since I was just there last night, I'm in no rush to return. As for your metaphor, since pearl is not really a gemstone, but is considered "precious," are you saying that Bartolotta is thus a cut above the rest in Vegas, yet somehow distinguishes itself from other well-regarded establishments?. Alba: Yes, I was at Angelini Osteria last night, and you're right, though I did enjoy the experience, it didn't change my perceptions. I think we can both agree that perhaps Italian fare simply doesn't lend itself to the "wow factor" of French, Japanese, or avant garde American--"rustic" and "soulful" sounds right. That's just something I need to come to terms with. In any case, be sure to let us know how your experience at Drago Centro turns out. At this point, I'm not having any luck finding one that able to create that "excitement". I perfer Border's mainly because Chef Michael specialize in Umbrian cuisine, which I believe is the most unknown and Auth. form of Italian cuisine is US. "mazzafegati" - sausages made from hog's liver, orange peel, pine nuts, raisins and sugar. "porchetta" - young roasted pig served with a strong flavour of wild fennel. I see what you mean Dason. Broder's cuisine seems very interesting, a definite departure from the norm for Italian fare in the US. tune, since you'll be able to discern the passion which your jaded LA spirit cannot fathom now. Kevin, the nervous server that was preparing your fish, is actually the Partner of operations with Drago :). They also changed the design of the restaurant, more whites/blacks.. I kinda like it! Anon: Point taken, but some things truly are pedestrian, no? Charlie: He looked really nervous and uncomfortable for a Partner of Operations. How about it indeed. Never been there myself, any good? 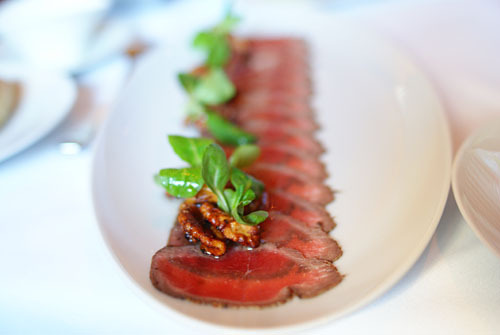 Always wanted to make venison carpaccio. We run a wild game food blog. Thanks for the post. Looks like a great place to eat.